The body requires certain substances to nor­mally develop and maintain itself. Besides oxy­gen, which must be continually inhaled, there must be ingested specific amounts of various food materials. These are water, salts, vitamins, min­erals, proteins, fats, and carbohydrates. A state of debility which ensues from an insufficient amount of any of these nutriments in the body is termed malnutrition. Specific states of mal­nutrition develop from a deficiency of any one or any combination of these. Nutritional deficiencies may be caused by a dietary lack, when they are said to be primary, or they may result from another disease state wherein the supply is abnormally depleted or improperly utilized, called secondary. Primary deficiencies were formerly widespread in occur­rence, but today in this country there is little economic or other necessity for such. Proper nutrition usually poses no greater financial hard­ship than the poorly balanced diets some indi­viduals select. Nevertheless, primary malnutri­tion is still frequently encountered as a result of improperly devised diets and poor eating habits. Secondary deficiencies of certain nutriments are seen in such diseases as chronic infection, dis­orders of the gastrointestinal tract, liver and gallbladder disease, cancer, neuroses, kidney dis­ease, dental disorders, and alcohol or drug addiction as well. Whenever malnutrition states are encountered, they must be treated by assuring an adequate in­take of the deficient nutriments. Often methods of administration other than the oral route must be employed. This sometimes takes a relatively long span of time. It is never possible to effect a normal state within a short period of time in tissues damaged by prolonged illness. Occa­sionally operation or other definitive treatment has to be deferred until nutritional deficiencies are corrected. Carbohydrates, fats, and proteins are the energy-supplying foods. Normally, their intake is dictated by the appetite. Care should be taken not to continually exceed the energy demands, as all excess is stored in the form of fat, leading to obesity. On the other hand, adequate amounts must be consumed so as not to deplete the body stores below normal. When the appetite calls forth for more energy food, there is no prefer­ence signified for any of these groups of foods. Actually, all the energy needs could be supplied by any one of these to the exclusion of the others. But this would result in nutritional de­ficiencies. Proteins serve in another capacity in the body which is not interchangeable with the other energy foods; namely, the construction and repair of tissues. Fats carry with them into the body certain vitamins which are actually dis­solved within the fats; the fat-soluble vitamins are A, D, E, and K. Protein deficiencies give rise to one of the most serious forms of malnutri­tion; insufficient fat intake could merely lead to vitamin deficiencies of the fat-soluble vita­mins. The chemistry involved in the body in proc­essing the energy foods is well understood. Each of these major food groups is composed of spe­cific chemical substances which are utilized in a specific manner. The carbohydrates are com­posed of combinations of simpler compounds, called sugars. Fats are comprised of basic chem­ical compounds called fatty acids, which are united in various combinations by glycerol. Pro­teins consist of various combinations of chemical units called amino acids. Detailed study of the construction and con­version of these energy-supplying foods is not of great importance to this work, but it should be realized that the source of nutrition is now far advanced and the body’s nutritional needs are well established. Acute and chronic protein deficiencies are most important in the field of surgery. All the vital structures in the body are placed in jeop­ardy in this form of malnutrition, and normal healing of tissues is impaired. The protein sup­plied the body must be complete; that is, it must contain certain required amino acids. 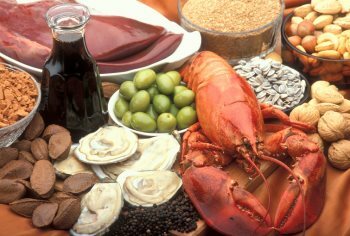 Nine such essential amino acid groups and their deficiency effects have been described. Tissues damaged by long-standing protein deficits are slow to return to normal, even with massive administration of the specific substances. If the protein insuf­ficiencies are secondary to some other disease, correction of this may first be necessary. In the last few years it has been possible to augment the oral intake of proteins with intravenous in­fusions (“vein feedings”) of protein substitutes and synthetics. Sometimes transfusions of whole blood or plasma are indicated for this purpose. Primary water and salt deficiencies are not common, but secondary deficiencies of these sub­stances are frequently encountered. Acute up­sets in the internal acid-base balance are directly related to the water and salt proportions. Dis­turbances of these chemical systems present a serious situation, but if the upset has not pro­ceeded to the stage of irreversible damage, cor­rection can usually be accomplished in a rela­tively short span of time. This again is a highly technical subject involving all systems of the body. A deficiency of water in the tissues is called simply dehydration, while disturbances of the salts are termed according to the chemi­cal upset they manifest. The vitamins are utilized in the body as cer­tain tissue components and as agents in certain chemical reactions. Each vitamin has a specific function, and a deficiency of any vitamin pro­duces a definite disease entity. The vitamins all have a known chemical formula and a chemical name, but are commonly referred to by alpha­betic letters; namely, A, B, C, D, E, K, etc. The B vitamins are actually a group, called collec­tively the B complex and individually by sub­numerals such as B-l, B-2, B-6, etc. Insufficiency of any vitamin is called avitaminosis, and the resulting disease state is afforded a specific name. For example, avitaminosis C produces scurvy. Vitamins can be stored in the body, but only in limited quantities. The amounts of each vitamin needed by the body are small but must be sup­plied daily, since the storage capacity is so mi­nute. Excess quantities of the vitamins are elimi­nated through the kidneys and bowels. The utilization of minerals by the body is simi­lar to that of the vitamins. Minerals enter into various chemical reactions in the functioning tissues and serve as structural elements of some tissues. All the minerals have a definite purpose to fulfill in the body which, like the vitamins, cannot be performed by any substitute. Similarly, a definite amount of each is required for normal body function and a deficiency of any one pro­duces a definite disease state. The principal mineral elements are calcium, iron, phosphorus, potassium, sodium, sulfur, iodine, chlorine, nitrogen, and magnesium. There are also several other minerals serving in the body in trace amounts, but their requirements and physiological mechanisms arc not well estab­lished. Some of the minerals are used over and over again; for example, the iron used as a com­ponent in the manufacture of red blood cells may be used throughout the life span of several suc­cessive generations of cells. But even so, a small amount of each mineral is depleted and must be replenished daily, since storage capacities are minimal. Dietary mineral excesses are excreted in the urine and feces. As might be expected, deficiencies of the nec­essary food elements are more often multiple than singular. When a person is deficient in one vitamin, he is usually deficient in other vitamins and minerals as well. Treatment of multiple de­ficiencies can be carried out simultaneously. Milk and milk products—2 glasses or equivalent daily for normal adult; 3—4 glasses for children; 4 glasses for expectant and nursing mothers; may be used as bev­erage or in cooked foods; cheeses, cottage cheese, evaporated milk, powdered milk are acceptable variants; skim milk may be used for low calorie diets; flavorings may be added. Meat, poultry, or fish—one average serv­ing daily; liver, kidney, peanut butter, dried peas and beans, and nuts are acceptable variants; select lean meat for reduction diets. Eggs—at least 4 per week, preferably one each day; prepared in any manner or in other foods; powdered or dried whole eggs and frozen eggs are the only substitutes for fresh eggs. Bread, cereals, or other grain foods—2 slices of bread, or 2 servings of cereal or other grain food, or 1 slice of bread and 1 serving of cereal; bread should be whole grain or enriched white bread; cereals may be dry or cooked; flour foods are grain foods. Butter or oleomargarine—at least 2 pats per day; fortified margarine and butter are of equivalent food values; no substitutes. Green and yellow vegetables and pota­toes—one serving of each per day; prefer­ably at least one should be raw; canned and frozen vegetables are acceptable. Citrus fruit—one serving each day; may be served as juice; use fresh, frozen, canned, or concentrated, but not cooked; strawberries and cantaloupe are suitable substitutes; two servings of tomatoes or tomato juice are equivalent to one of citrus fruit. Other fruits—one serving each day, may be fresh, dried, or canned; may be cookcd or raw. Supplements to the diet of vitamins and min­erals are sometimes prescribed. As far as is known, no harm results from using these arti­ficial sources, and actually they are of the same chemical composition as the natural substances. However, it is better not to become too depend­ent on these substitutes, but rather to develop good eating habits incorporating foods which provide all the natural vitamins and minerals. It is not unlikely that there arc other vital sub­stances to be found in food which are not yet known. Moreover, there is no practical artificial source of the required proteins; these must come from food. Advertising by vitamin manufactur­ers is frequently rather misleading, and often such products arc very expensive sources of vitamin supplements.